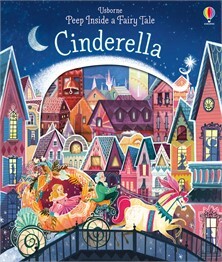 Little children can peep through the laser-cut pages of this magical book and follow Cinderella through a fairytale city to meet her perfect prince. Beneath the flaps they can discover Cinderella’s fairy godmother, her selfish stepsisters and a fabulous golden carriage. A delightful way to introduce children to this much-loved tale.